Hi again, everyone! Sorry for the long delay... been getting all of my stuff together for school and spent a few days in Atlantic City. My mom was the big winner, but I didn't lose too bad at all! Today, I have a little mani that I have dubbed Space Girl Nails because it reminds me of outer space! I used Zoya Suri (which you'll see swatched on its own later in the week), topped with Nfu Oh 61 and a little stripe of Zoya Mira. I think Mira adds that little extra pop, don't you? Because it has been pretty rainy here for a few days, I couldn't get any sunlight swatches. Yeah, this was INDOORS. And I love it! So what do you think of the Space Girl Nails? 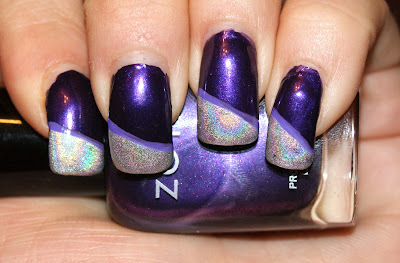 And remember to enter the Olympics Nail Art contest before time runs out this weekend! 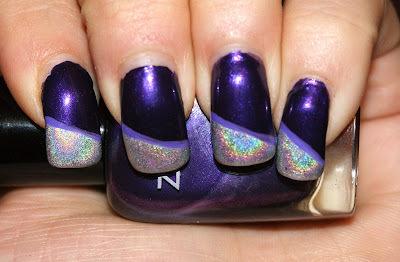 That holo effect is stunning!